← Why should you consider attending The PLE Conference 2012? I had promised to write a blogpost on The PLE Conference, but as usual couldn’t find the time to do it. So, finally, here it goes. The PLE Conference first became an idea back in 2009. A bunch of us got together for another conference, and at some point got fed up with it: same traditional format, people doing their thing and then disappearing (I know, we kind of did the same), the audience being basically the presenters themselves, no networking spaces, spotty WiFi and so on. It was not the only conference I had been to with those characteristics; 2009 was a very busy year for me in terms of conferences and events participation, and most of them failed to live up to my expectations. Anyway; here we were, Graham, Cristina, Maria, Tobias and I. We also managed to kidnap Andrea, whom we had met after his presentation. We went to the seaside and a couple of drinks later, started talking about why conferences should be so, well, boring. And then someone said “we should host our own conference”. After a couple of minutes of silence, everyone started talking at the same time, with lots of ideas and suggestions. 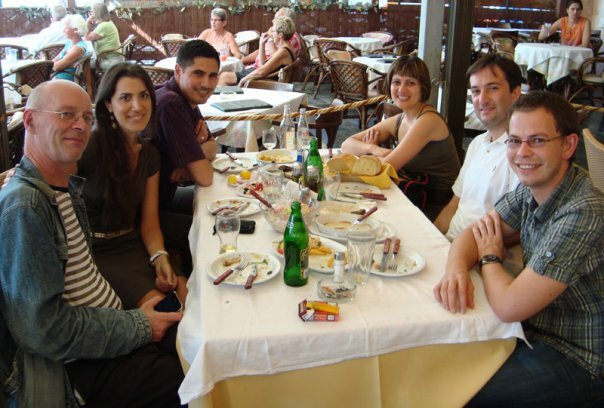 Eventually, we settled on PLEs as the focus of the conference: that was the reason we first got together as a team, and a couple of searches on Google showed there had been no face-to-face conferences on that topic yet. The only reference we could find was a virtual event. After this, it was a question of deciding where to host it. (This is where I got tricked). Everyone said “Barcelona, of course!”. Called one of my supervisors at the time, who assured us we would have 100% support from the foundation (Citilab, where I worked between 2008 and 2011), and that was it. 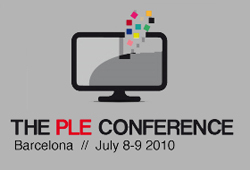 Barcelona would host The PLE Conference 2010. What I didn’t realise then was that of course I was also automatically being appointed local organiser. If I had known the implications! (well, to be honest, if I had known, I would still have done it). A couple of months later, we met again, at (surprise) another conference. By this time we have had a few emails and Skype meetings, and were ready to start working. Ilona became part of the team, as well as Linda and Rafa. And the hard work began. It was a lot of work: issuing the call, having weekly meetings, deciding on budget, trying to find sponsors, simultaneous interpretation, keynotes, accommodation, getting the venue sorted out, WiFi, setting up social networks presence and disseminating the info, getting papers, finding reviewers, deciding the final programme, sending papers back for corrections and revision, logo, banner, programme, finding “volunteers” (some of my students: Aleksandra, Andrew, Alex, Cheng, Marina, Martin), catering, setting up a space for the posters session, for the wine & tapas, lunch… It is amazing what happens behind the scenes, and you learn to have some respect for the people that organise this things. I can understand why some of them just go for the tried and proved template: thinking outside the box and trying to be innovative is risky and creates even more work. You cannot do it alone. Yes, I was in Barcelona and had to deal with a lot of things other members of the team simply could not do. I had a lot of help from Citilab and many of my colleagues there worked really hard on this. i2Cat were also very supportive and sponsored the interpretation and part of the keynotes accommodation expenses. Some of the teachers that were participating in the HortDigital project also helped and María José even offered to host Joyce! The organising committee did an outstanding job, and we had several people helping just because they wanted to. My only regret is that I couldn’t participate in all the sessions, and that I had to completely miss some of them, as most of the time I was running up and down the building sorting things out. For the second PLE Conference, I was still part of the organising committee, but with way less pressure; we had new members, and a great local team. Southampton was amazing, and kept the spirit alive. This year it has been harder for me to participate actively: lots of changes, both personal and professional, mean less time, but I have tried to keep the Twitter conversation going on, made it to a couple of meetings, did my reviews. I’m sure this year’s conference will be great, and I know that both the Aveiro and Melbourne teams are working hard on it, day and night. BUT. It is worth the effort. Gemma has already written about this, so I won’t go over it again, but the unKeynotes, the backchannel, the networking, the participation… all this has made The PLE Conference an event that is fixed in my calendar. Even if I don’t attend any other event, this is the one I won’t miss. How long will it keep running? I don’t know. Would the name still be appropriate in 3 or 5 years? Probably not. And that’s actually a good thing, in my opinion. But if something will remain, it will be the spirit, the inspiration, the camaraderie. I am extremely proud of being a part of all this, and hope I can continue helping and participating for many more years. Why are you still reading? Go mark July 11th to 13th in your calendar right now! You won’t regret it! This entry was posted in Global and tagged conference, personal learning environments, PLE. Bookmark the permalink.